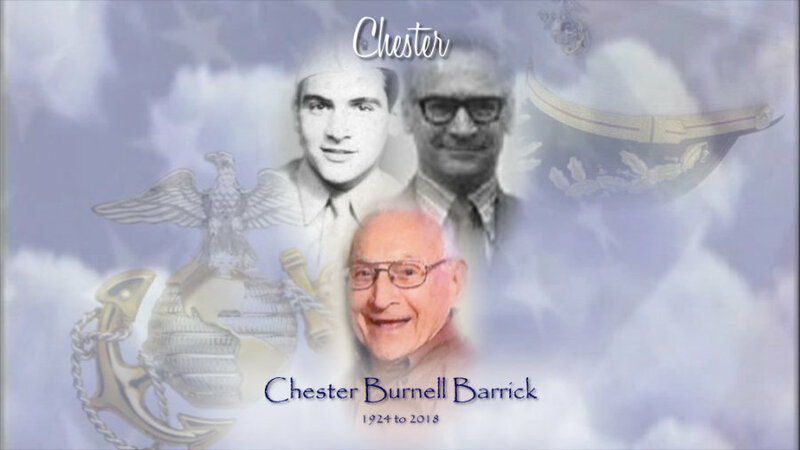 Obituary for Chester Burnell Barrick | Kenworthy Funeral Home, Inc.
Chester Burnell Barrick, 94, of Hanover, PA, entered God’s eternal care on Sunday, October 21, 2018 at home with his loving family by his side. Born October 14, 1924, in New Oxford, PA, he was the son of the late Chester J. and Ruth P. (Becker) Barrick. Chet was the devoted husband of Mary E. (Myers) Barrick with whom he shared seventy-two blissful years of marriage. Chester attended Littlestown High School. 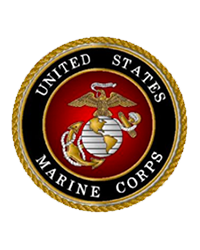 As a veteran he served his country proudly in the United States Marine Corps from 1943-1946 during WWII. He established Chester B. Barrick Insurance Agency which he owned and operated for 44 years. Chester was an active and faithful member of St. Joseph Catholic Church, Hanover, PA. His other memberships included the American Legion–VFW Hanover Post 2506, BPOE Hanover Elks Lodge, Hanover Lions Club, and 4th Degree in the Hanover Knights of Columbus. Chester created beautiful stained glass art including the stained glass windows in the Adoration Chapel in McSherrystown, PA. In addition to his loving wife, Mary, Chester is survived by his children and spouses, Anita and Bill Reese, Paulette and Bob Cape, Steve and Chrissie Barrick, Marilee and Bill Barger, Denise and Rodney Markle, Ron and Karen Barrick, Shell and Jim Bethas, Brian Barrick and Tao Chen, Jen and Nick Gentile, Mary Barrick and John Rash, Lynne and Cory Morgan; and two siblings, Jean Barrick, and Robert Barrick. He was preceded in death by a brother, William Barrick and a sister, Gladys DeMers. His legacy continues with 26 grandchildren and 33 great-grandchildren. A Mass of Christian Burial to celebrate and remember Chester will be held 11:00 AM, Friday, October 26, 2018 at St. Joseph Catholic Church, 5125 Grandview Road, Hanover, PA, with Monsignor James M. Lyons as celebrant. Burial will be at St. Joseph Catholic Church Cemetery, Hanover, PA, with the Hanover Allied Veterans Honor Guard Burial Detail providing Military Honors. Viewings and times to share memories with the family will be held from 6:00-8:00 PM, Thursday, October 25, 2018 at St. Joseph Catholic Church, 5125 Grandview Road, Hanover, PA, and from 10:00-11:00 AM, Friday, October 26, 2018 at the church. In lieu of flowers, contributions in Chester’s memory may be made to St. Joseph Catholic Church, 5125 Grandview Road, Hanover, PA 17331 or the Hospice Program of the VNA of Hanover & Spring Grove, 440 N. Madison Street, Hanover, PA 17331.